subroutine Trace – If successful, place 1 power counter on Data Raven. Maybe I'm wrong, but this is hands down my favorite piece of ice. First off, the subroutine is perhaps one of the most powerful in the game. If the trace succeeds, that tag on demand virtually guarantees a corp victory (provided that the corp has Scorched Earth. Secondly, the ice itself is pretty darn strong. As a strength 4 sentry, not only will the runner have to boost to break the subroutine, but they've still taken that tag and will have to save a click at their end of their turn to shed it. (Both of these effects have a strong counter in New Angeles City Hall, but that's still an impermanent solution). The best part of this ice, though, is having the Runner voluntarily jack out when they encounter it. I am infinitely satisfied when the Runner ends a run on a remote server with an AstroScript Pilot Program or a duble-advanced Project Beale installed in the root. 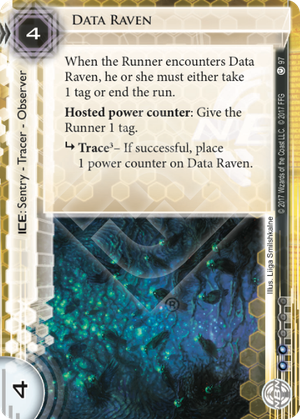 Data Raven works best, though, on R&D, often being enough to convince the runner to start checking other places first. At best, Data Raven + Scorched Earth will win you the game, and at it's worst, it's still a huge tax. (Not to mention the synergy it has when installed with a Universal Connectivity Fee backing it up. Get ready for a upgrade that turns this card into a program-murdering demon: Keegan Lane. This fine gentleman plus the tag from encountering the raven means the runner's programs are screwed. Unless the runner has Femme'd every Raven, or has a few Inside Jobs, this is a massive roadblock in a runner's setup. Include recursion or multiples against post-Data and Destiny NBN decks. Relying on one copy of a breaker and facechecking into this combo will probably end the game.